Stout throughout, and behind throughout, the bedragged Seahawks had a good shot against the Falcons, but Pete Carroll’s decisions were obstacles too big to surmount. Given the circumstances entering the game, it was entirely reasonable that the Seahawks defense would be vulnerable to a big game from a quality Atlanta Falcons offense. And since the Seahawks offense was only Wilson-dimensional, it too, could be expected to falter. Special teams were in trouble too, since several key players were advanced to the first team because of injuries. So being down 14-0 halfway through the first quarter was hardly a shock. All three units did enough good things to put the Seahawks in a position to pull out a win over the defending NFC champions on Monday night after 11 days of bad health news created the most personnel disarray of Pete Carroll’s coaching tenure. But of all things in an excruciating 34-31 defeat, what did in the Seahawks was the one element impervious to failures of the flesh: Carroll. His decision to fake a field goal attempt for a play that failed disastrously, coupled with mismanaged second-half timeouts that shrank the margin for error in final drive, helped squander an otherwise valiant effort to remain relevant despite increasingly dour odds. Despite the injury absences of CB Richard Sherman, SS Kam Chancellor, DE Cliff Avril, DT Jarran Reed and numerous others, they lost barely, 34-31, when just a small ration of cool from Carroll might have had them in first place in the NFC West at 7-3. Instead, they are 6-4 and reeling from more injuries (CB Shaquill Griffin, RB Mike Davis, RG Oday Aboushi), as well as a feeling of slippage. WR Doug Baldwin struggled to avoid second-guessing his coach on a play that had the rest of the Monday night football nation bewildered. “Yeah, hindsight is 20/20,” he said quietly of the foregone three points in a low-percentage bid for six. “You wish now we’d had that (field goal). The game plays out differently. In that situation, everyone in the world thought we were going to kick a field goal. Whether it was perfect is debatable, but it certainly was true that everyone in the world anticipated a field goal, in the way that a thirsty person anticipates a drink of of water. Instead, Carroll ordered a double shot of Fireball. Passing on a 34-yard field goal attempt from Blair Walsh that would close the halftime deficit to 24-20, Carroll at :07 dialed up a fake that had placeholder Jon Ryan shovel a pass to TE Luke Willson running across the formation. The idea was to sweep in for a touchdown or get out of bounds by :01 to kick the field goal. But the Falcons, alerted by coaches for a fake, kept in the No. 1 defense. DT Grady Jarrett surprised the Seahawks with his positioning and blew in to crush Willson for a four-yard loss. The outcome so perplexed the 69,026 on hand at the Clink that they barely mustered a few boos. “It was a chance to make a big play. We had a chance to make a touchdown, or get out of bounds. If that pops, he might walk in. We were prepared. We had worked on it, we saw something that we liked. We didn’t expect the nose tackle to make the play. We felt we would get him knocked off and we didn’t. It certainly was aggressive, which is often good. But the Seahawks had done a stout job of hanging in through the first half, and maintained close quarters throughout. So to take the away the reward of an almost certain three points to risk a horizontal play that requires well-timed execution from a repeatedly suspect line — and to hope their old defensive coordinator, Falcons head coach Dan Quinn, didn’t remember it — was asking too much. Asked what he saw, Willson said, “(Jarrett) wasn’t supposed to be there. I was just watching the ball. Then the second half, the Seahawks burned up their three timeouts ahead of the final possession that began with 1:46 left at their own 25. The most egregious waste was a coach’s challenge on a pass to Baldwin that was ruled incomplete. Replays in stadium and on TV showed the call clearly was correct; Baldwin didn’t control the ball before he hit the ground. The call was upheld, a timeout was lost, and Carroll explained that it was because he trusted Baldwin’s version of events. “Doug and I have been through this for years, and he’s been right a bunch of times,” he said. “The ball may have touched the ground, but he knew he had secured it. That’s what he said. What is it they say in national security briefings? Trust, but verify. Anyway, Russell Wilson coaxed the Seahawks into another harrowing last-minute adventure — on the previous possession, they traveled 75 yards in five plays that took 49 seconds for a touchdown and two-point conversion — that reached the Atlanta 34-yard line before he spiked the ball to stop the clock at :07. Carroll admitted he was ready to try another pass play for a few extra yards. But after an Atlanta timeout, he calmed down and chose the option of a 52-yard field goal attempt from Blair Walsh, whose career-long was 56, to force overtime. Short. By about two feet. Ballgame. Actually, there were a lot of simple things that could be thought about that could have made the need for 24 inches unnecessary, including nine penalties for 106 yards — the NFL leaders in crime have been over 100 yards for five games in a row. One of them happened on Atlanta’s final punt, a hold by an obscure special-teamer, Josh Forrest, that forced the Seahawks start at the 25 instead of the 35. As always, the if-then game is nearly infinite. But the facts were that the players screamed back from 14-0 and 21-7 deficits to stay in a game in which they appeared out-manned, something rarely observed in the Carroll era. After a period of despair over the physical losses to a team beginning a fade from eminence, they deserved this one shot at another glorious Monday night dazzler. Just as players, coaches are allowed to make mistakes too. And perhaps that will be accounted for in the Carroll tradition of “tell the truth Mondays,” one day late this week. Injuries aren’t all physical, but those heal too. Bottom line, Seahawks are not that good this year. Trading away Max Unger turning point for offensive decline. I would suggest flawed judgment on the ability to develop O-line talent fast enough to reach NFL-average. I don’t like to say all of the above, but it’s true. Selection is a group endeavor at the VMAC. Selection is compounded by two things: The increasing number of college linemen poorly prepared for pro ball, and Seattle’s imbalanced payroll under the cap that pays defense first, second and third. Many teams have similar O-line problems. Seattle in the Carroll regime has grown only one lineman into a second contract, Britt, and he played three positions in three years before he got it. Well, if you think much of Pro Football Focus (which in my case depends dramatically on what positions they are evaluating), it really is not true that “many teams have similar O-line problems.” Seattle’s O-line has been consistently bad for going on three years now. Like “linemen at or very near the bottom of their positions league-wide” bad. Their run blocking in particular has been horrendous, with the trend line over those three years going down, not up. But their pass blocking has certainly not been great, either. Russell doesn’t help their stats in one way, but even with that discount they are just not good, at all, as a group. Brown looks like the only truly good passblocker they have, really, and the rest range from ok at best (Britt, maybe Pocic), to various levels of poor (Ifedi, Glowinski, Aboushi). And Brown is not a great runblocker, unfortunately. I’m not sure money is the issue. With Joeckel, Ifedi, Britt, Pocic and now Brown (all first or second rounders), there are now enough high draft choices on that line that talent evaluation and coaching must be significant factors as well. The fact that we haven’t re-signed anyone but Britt may be as much or more about nobody being good enough to re-sign when his contract is up, as opposed to not having enough money to do so. If so, that would be about talent and coaching, period. 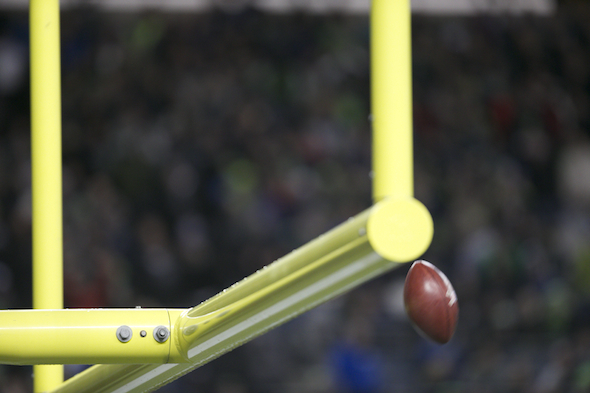 A NFL kicker can’t hit it 52 yards. SMH. And it was a dry 52. Nice write up Art, to the point without going overboard. One thing I can just about guarantee–Pete, on Tell the Truth Monday, will not admit that the fake field goal was a bad call. Let’s see here…the “plan” was to give a big tight end the ball with about 6 seconds to go (at the most, after he actually received the handoff), in the middle of the field, and have him take it 20+ yards into the endzone…or for a first down with enough time to call your last timeout…or to get out of bounds after a first down before that 6 seconds expired. And it was also the “plan” to have a 250 lb long snapper who plays maybe 3-5 plays per game deny penetration on his own to a 300 + lb starting DT, so as to clear the way for the tight end. Bad play design for the personnel, but worse, horrible situation to call it in. Shades of the Super Bowl play–not necessarily a bad call for all circumstances, but clearly a bad call for the personnel on hand, and in the circumstances presented. Once again, this is Pete going “hormonal,” to use his own term. The man is a master motivator and teacher, but not at the same level as a gametime, on the field coach. He is impulsive, when what is called for is cold-blooded calculation of risk and reward under pressure. Nice job summing Pete up. I think you pretty much nailed it. The two-point conversion decision to try and go up by 9 last year vs. Patriots was another head-scratcher. Just strange, rash decisions that seem to be being made by the seat-of-his-Dockers, vs. the actual sound decision based on stuff like, you know, basic math and probability, etc. Carroll admits to some impulses, as would many coaches if they were as secure in themselves as him. But that’s one reason why coaches have coordinators. Well said. Tactful without naming names. If you read my follow-up story off his Monday radio interview, indeed he did not back off. Your take is good, Bruce. The issue is a nearly sure three vs a low-percentage try for six with a play unused this season and for the entirety of his Seattle tenure. It’s also an admission of desperation that neither the offense nor the defense can recover all of the deficit, so special-teams gadgets must be deployed. It’s hardly illogical, but does give some context regarding his assessment of risk/reward. i think the timeout management was more impactful on the outcome than the fake FG or the long missed FG. We needed to go ahead, not force overtime, to win this game. I have alot more confidence in our two minute drill (when we have timeouts) than our kicking game. Assuming a made FG, OT would have been to Atlanta’s favor. Sheesh they got 16 yards over the middle on every snap and altho we finally stopped them late, i think OT would have been a different story. It angers me that the Seahawks are squandering their franchise QB’s best years by failing to provide him with an offensive line and a reasonable running game. Carrol wants to invest in defense but they need to spread it around or we will waste our best opportunities with Russell Wilson. When you look around the league and see how some franchises struggle without a leader while Seahawks basically expect ours to do everything himself while they continue to spend on the defense. Imagine what he could do with Matt Hasselback’s offensive line. There’s two words for what you describe: Salary cap. Virtually every team goes through personnel down-cycles due to injuries, age and contract sizes, all holding great variability. Look at the recent history of the Saints and Drew Brees: They won a Super Bowl, fell into despair, and now are back to the top shelf. Pre-game show highlighted all the unforgetable Seahawks Monday night fake field goal attempts. I had a feeling right then Pete was going to do that and also that it wouldn’t work this time. Too much ground to cover, I thought. The season’s not over…Yet. But it almost feels like it. It feels like the beginning of the end of a wonderful era. My question is…Will Pete make like a Bellachick to pattern the Seahawks after NE to sustain the ability to stay on top? Going back to USC, there is good BBP, and there is bad BBP. This was the bad. The second stringers played well enough for them to win. They’re just not good enough to overcome coaching mistakes. Really frustrating and winnable game over a quality opponent. What’s even more frustrating is Wilson is playing at a level where they can beat anyone, even with their lack of run game or LOB because the rest of the NFL is so mediocre this year, but they may not even make the playoffs. I don’t want to completely blame Walsh for missing a 52yd. FG on a cold humid night at sea level (watching that ball die was like watching a Safeco HR turn into a pop fly), but if he hits a few more, they could be 8-2. Ah, but they would be the weakest 8-2 team in NFL history. But you would take it; I understand that. A 7-9 team that had no business being the playoffs gave us the Beast Quake. Russel Wilson is playing out of his mind. If they can just get in the tourney, who knows what could happen? If they get stomped by the Eagles, we’ll then know. I’m sorry, I love Doug Baldwin, but had it actually been the”…perfect time for that play that we were going to call in that situation…”, the play would not have gotten blown up behind the line of scrimmage. It was another horrible call in the final minute of a half. Another in a long, long list that we have become used to seeing in the Pete Carrol era. Granted, there have also been many gutsy calls that were successful, but way too often the ends of halfs get mismanaged and opportunities get missed. I think if you were to compare Carroll’s game-strategy deeds with all his contemporaries, you would find him about NFL average. But none of us in Seattle care about other teams’ exploding cigars. You might be right, and lets give credit where credit is due, he won a Super Bowl and got to a second. However *his* decisions are the ones we are focused on each Sunday. His cavalier attitude regarding the clock, timeouts and the challenge flag drive me crazy. The Hawks would not have had the success they’ve enjoyed if ALL of those decisions failed, but the failures are just so maddening that they can sometimes overshadow the successes. That sound you hear is the window closing on the Seahawks. They have had a good run, but between age and injuries, it is time to rebuild. This was one of the more painful Hawks losses that could have and should have been a win. If any one of a number of disastrous errors hadn’t happened, it might have been. Everyone knows what those errors were, so there’s no need to go down the list and lay blame here. One overall team failure that glaringly stands out (again!) is that after repeated declarations by Carroll and Cable about the need to reduce penalties, the Hawks once again racked up, as Art points out, 106 penalty yards on nine penalties. It almost seems like the Hawks are trying to compensate for lack of talent by playing a style of over-aggressive ball, which is biting them badly both on offense and defense. This lack of talent, combined with an unprecedented loss of capable players to injury has put the Hawks in the once-elite- but-no-longer category. They will be very lucky to make the playoffs as a wild card. Home field advantage or a first round bye seem totally out of reach. I don’t know if it’s my home-team bias showing but it seems to me the refs are on the lookout for anything to call on the Hawks. Every game I watch calls that leave you scratching your head or screaming at the TV while watching even worse penalties by the other team go un-noticed. I’m sure you all noticed the pass interference by Atlanta in the end zone during the second half that had the commentators playing it back and saying WTF. I saw one just like it last game with the Seattle receiver getting mauled right in front of the ref. No call. There was an obvious hands-to-the-face non-call on an end sweep by the Hawks deep in Atlanta territory in the second half. No call. And don’t get me started on how Seattle gets called on pic plays (where the receivers cross and use the cross to free one of the receivers) while other teams don’t. Larry Fitzgerald is a pro at getting away with that. Not Seattle though. No. It’s not just you. You are one of many. And like most conspiracy theorists, you are all wrong. Sorry, gonna have to disagree on this one, I believe in conspiracy FACT, not conspiracy theory. I was yelling at the TV for Pete not to challenge – YES, verify! I couldn’t believe that Doug really believed that the catch was good, and I heard that he knew it touched the ground but he thought he had control – Instant Replay 101: got to be enough to overrule the call, yadda, yadda, yadda. Then I expect that when they’re playing a formidable opponent, mistakes will be made. But they gotta quit making all of those unforced errors. On the bright side, this team is amazing, and other than the noted mistakes, has the ability to rise up and beat anyone. We found out that Mike Davis has “IT” – “IT” being this years version of what it takes to run the friggin’ ball behind the Seahawks’ O-line. We already knew that Carson has “IT”. If these two guys can just get healthy at the same they would be an awesome one-two punch. I enjoy reading your insights over the years, Art, but have to disagree with your premise that this loss falls solely on Pete. I didn’t like the call for the fake field goal, or the ill-advised challenge, but there was a lot a blame to go around. Dwight Freeney was let go today. I imagine he would still be on the team if he hadn’t given up a huge play when he was out of position and let Ryan run free. It was Russell that cost us the game by gifting the Falcons 14 points in the first period with his two turnovers. Luke Willson would have scored as there was a hole for him to drive a truck though were it not for Ott whiffing on his block. If you want to blame Pete for losses, blame him for the team’s lack of discipline, i.e. penalties.